Zambia based striker Jesse Were is the surprise exclusion as Harambee Stars head coach Sebastien Migne trimmed his squad dropping three players ahead of early Thursday morning’s departure for their final African Cup of Nations qualifier in Ghana. Were has been dropped alongside Kariobangi Sharks forward Duke Abuya and Mathare United’s Cliff Nyakeya as Migne trimmed his squad to 21 for the trip. The former Tusker FC and Mathare man has been in sizzling form for his Zambian club Zesco, but has seemingly not found favor in the national team. Defender Brian Mandela is however a major doubt after picking up an injury in training Wednesday but has nonetheless been included in the final squad. New call up Christopher Mbamba has been included after managing to get his paperwork right. 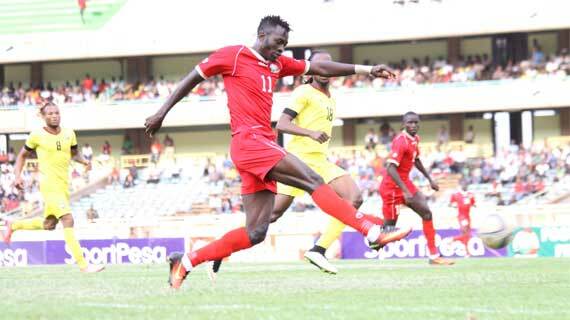 The Sweden based youngster was yet to get a Kenyan passport and missed Wednesday’s training to sort out the issue. Masud Juma (Al Nasr, Libya), Allan Wanga (Kakamega Homeboyz), Piston Mutamba (Sofapaka).